1. South Korea’s Hanwha Engineering & Construction company signed a $1.05 Billion deal to build a power station and desalination facility in Saudi Arabia. Expected to be completed in 2014. 3. Abu Dhabi implemented an Aquifer Storage and Recovery (ASR) Program, which used the over capacity of desalination plants to replenish the underground water reservoir. Dubai is now following in similar footsteps by implementing a pilot project to recycle 182.5 million M3/year of generated wastewater to help recharge depleting groundwater supplies. Currently, 70% of all municipal wastewater in Dubai is being reused after treatment. 5. South East England mitigates water stress by implementing a 50 million metering program, increasing the number of metered customers to 70% however they will not be charged until 2012. Asia- Pacific: None of the top tier companies have a substantial presence: however GE, Siemens, Degremont, and Veolia have regional offices for early entrants. 17 Minutes Under Water and Still Breathing!!! What people can do when they focus on an extreme goal is truly amazing. David Blaine held his breath underwater for 17 minutes and 4 seconds on national television on the Oprah Show in 2010, and he contributes all of his perpetration and health record to science research. David Blaine is a magician and stuntman, so most thought is a trick. However, his talk at the TED conference in 2010 takes you second my second through Blaine’s preparation and execution. Discovering that past 6 minutes of no oxygen brain damage occurs, attempting to constantly flush his blood to increase oxygen levels, attempting to insert a rebreather with a Co2 scrubber into his lungs; Blaine began to see that there was no way to establish an illusion of holding your breath. So he turned to free diving and static apnea (holding your breath in one place without moving). Learning how to purge (blow in and out, ridding your body of Co2) entering into an extremely intense diet to rid all extra weight and improve his lung capacity Blaine began to hold his breath. After four months of training his heart rate lowered to 38 beats per minute that is lower than most Olympic athletes. As a result he could hold his breath for 7 minutes at this point. In training attempts to hold his breath Blaine’s heart rate drops from 38 beats per minute to 12 beats per minute after the first minute. However when it came time to complete the stunt on television Blaine’s heart rate started at 120 beats per minute and stayed at this level for 5 minutes, and it continue to rise to 150. At 10 minutes blood shunting began to occur after 14 minutes he had an “urge to breath” his chest would uncontrollable contract, and ischemia began to set in. At the end of the day David Blaine went from being obsessed with Houdini to surpassing Houdini’s underwater record (3 min 30 sec) by the age of 8 years old to now setting the new world record for holding your breath underwater for 17 minutes and 4 seconds. According to the AWWA 08 rate study: National water and wastewater charges increased 12.3% and 15.1%, respectively, for a residential customer using 1,000 cubic feet (cf) of water a month between January 1, 2006 and July 1, 2008. During the same period, the Consumer Price Index (CPI) for all urban customers increased 10.9%. Between 1996 and 2008, water and wastewater charges for residential customers using 1,000 ccf per month have increased 4.21% and 4.39% annually, respectively, which is greater than the annual CPI increase of 2.87% (AWWA Rate Study, 2008). Water and wastewater charges are highest in the Northeast while water and wastewater charges are lowest in the Midwest (AWWA Rate Study, 2008). Even with the charge increases, water and wastewater charges remain affordable as defined by the US Environmental Protection Agency. (National Census Data). How much water does it take to make consumer goods? Chris Hendrickson and Michael Blackhurst; two engineers from Carnegie Mellon University estimated water use among +400 industry sectors. Calculated all water inputs used for these interrelated industries to shed light on the total amount of water that goes into the manufacturing of consumer products. Their work was published in the Feb. 23, 2010 edition of the journal Environmental Science & Technology. The results were overwhelming because more water use occurs indirectly as a result of processing (packaging, shipping, etc). This study presents growing awareness of indirect water consumption in consumer products and that being said the United Nations estimates that one-quarter of the world’s population, mostly among the poorest countries, won’t have sanitary drinking water by 2025. Living Water International is a non-profit organization that shows you your potential impact on the environment from consumption of coffee and bottled water. It introduces the current water issues in Sub-Saharan Africa (40 billion hours of labor wasted each year in carrying water long distances). Their description of water on a Global Scale drives home issues that plague billions in the picture from the there website below. The Pursuit of Water is a project that is focusing on worldwide social issues about water, gathering together the globe and bringing change through creative, innovative media. Providing a brief introduction of water issues, The Pursuit of Water, is a great gateway to becoming involved in water projects by connecting multiple water efforts across the globe. Water.org is an extremely powerful non-profit organization that not only introduces new water issues, but they have extensive practical solutions to implement against these issues. For instance, you can choose to become involved or donate to their micro-finance loan system that aid people living in impoverished regions with the financial burden of improving their water source. They have extensive media coverage of their work because of the celebrity (Matt Damon) who has become a spokesperson for them. They have an extreme goal that aims to aid in providing everyone in the world with clean water. The One Drop goal is to fight poverty by providing access to water and raising awareness among people and communities about the need for mobilization to make safe water accessible to all, in sufficient quantity, today, and tomorrow. One Drops’ approach is a tripod approach based on three complementary components: Technical, micro-finance, and social arts/popular education. Currently, they have active projects in Nicaragua, Honduras, Haiti, El Salvador and India. Amman Imman: Water is Life is similar to Water.org and One Drop, but this non-profit began in 2006 by Ariane Kirtley (Fulbright scholar researching in Azawak, Niger). The program started by drilling wells then a partnership developed providing maintenance to the wells, and now it has expanded into a network of schools, food production, and development. Improving health, education, lifestyle, and efficiency among the people of Niger. Now Amman Imman is focusing on helping other water projects in Africa, the next being Azawak of West Africa (goal is to develop 50 or more cases of life across Azawak). Charity: Water now has 3,962 water focused projects, and they have raised more than 20 million. The projects are located in Bangladesh,Bolivia, Cambodia, Central African Republic,Cote d’Ivoire, Democratic Republic of Congo, Ethiopia, Guatemala, Haiti, Honduras, India, Kenya, Liberia, Malawi, Nepal, Rwanda, Sierra Leone, Tanzania, and Uganda. They Connect with other groups to execute these wells and to promote further development of these regions by providing videos of the contamination. For example here is the footage from Kenya (http://www.charitywater.org/projects/fromthefield/kenya.php). If your interested in seeing the conditions of these nations water then pick a country that interests you and see how what is not shows on Discovery. You can take the bull by the horns with this organization and sponsor a water project and see the phases of development. Relating these projects back to UC Berkeley Campus, the UC Berkeley students have begun an initiative to end the sale of plastic water bottles on campus. They have been able to remove the bottled water from all vending machines on campus, and sustainable water bottles are sold as a replacement forcing students, and faculty to reuse their water containers. Launch space shuttle: water on the take off platform absorbs sound so that the sound does not rip apart the space shuttle. Patricia Mulroy took control of Las Vegas water usage after having to see that its main source of water was from Lake Mead, is restricted by federal law to extract 300,000 acre-feet of water (lowering Lake Meade by 2-3 feet). Therefore she attempted to change the culture of the inhabitants in Las Vegas by) replacing lawns with zero-scape, making it illegal to let your sprinkler spray on a sidewalk and made it illegal to drain your swimming pool or hot tub into a storm drain. Las Vegas will even pay you $40,000 an acre to remove your lawn (depending on scale). Incentivizing zero-scape (desert landscaping use little to know the water. As a result, Las Vegas has been able to recapture almost all of its water (94% water recycling returning water back to Lake Meade). Las Vegas uses the same amount of water today as it did in 2000 despite a 50% increase in size. The golf course now have water budgets (600 million gallon and decreased by 50%) but still each whole of golf with the new regulations requires 139 gallons of water in Las Vegas. Similar quantities of money are spent on bottled (questionable) water ($21 billion annually) as is on maintaining water systems ($29 billion annually). Orlando Florida (Orange County) 25 years ago implemented a grey water system (purple pipe system) for lawn watering, athletic fields, and construction sites. The City has grown by two percent, and the water consumption of water has not had to increase water use. IBM now uses water efficiency as a business tool. Ultra pure water uses a tremendous amount of water (12 steps of filtration past desalination) 2 million gallons of ultra-pure water is used per day in an IBM computer chip plant. Reconstructed their water usage in their plants and over ten years they reduced water consumption by a third but in that same period they increased chip production by a third. 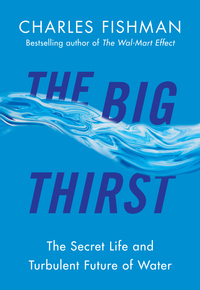 “The Big Thrust” is on my “to do” list just to see what other solutions and situations Charles Fishman has come across in his research on water. Laurent Auguste: President of Veolia Water (North America) presented Veolia’s new Water Impact Index at the 2010 Milwaukee Water Summit to show the new trend in water Sustainability. The Water Impact Index will assess the impact of the activity or a product upon a freshwater source through the impact on the quantity of the water, stress on resources and quality. The Importance of the carbon footprint impact because there are alternatives of Gas and Coal. But unlike oil water does not have an alternative, 8 tons of oil is consumed per year while 2,140 tons of water is consumed per year (250 times more). Water is consumed in two fashions withdraw and pollution. It is almost impossible to build a global calculation due to the local and regional difference of water resources. But locally this water footprint can show the efficiency and effectiveness of water conservation and infrastructure. The 2010 April edition of National Geographic introduced the virtual contents of water in products; this issue introduced a form of awareness similar to how calories did for the food we consume. However, Veolia points out that yes this awareness is important but the National Geographic model failed to incorporate the component of water quality and water stress impact. For example, the National Geographic model states that Peanuts were six times more impactful then Tomatoes sauce. But when really looking at the life cycle to the two products it is vice versa, Impact of Tomato sauce: irrigated farm typically in water stressed areas, required fertilizer (pollution) while the impact of Peanuts: rain-fed agriculture. This is important for how we understand basic consumer products. Therefore, we must look into more than just volume consumption, but also the level of stress and quality. The Calculation that Veolia has developed has two basic stages indirect and direct impact. The indirect are typically added to regional and local differences while the direct is: Water Stress Index x ((Volume consumed by utility x Quality Index)– (Discharge water x quality index)). This video below introduces a basic Case Study Veolia had done in Milwaukee using extensive data from Milwaukee Metropolitan Sewage Districts, Milwaukee Water Works, North Shore Water Commission, Oak Creek Water and Sewer Utility, and Cudahy Water Utility. The research broke down the Urban Water Cycle into: Raw Water Abstraction, Drinking Water Production, Drinking water distribution, wastewater collection, wastewater treatment, treated wastewater release, waste and sludge management, and network maintenance. Completed a cost benefits analysis on the efficiency of resources used across each and pinpointed inefficiencies through he Carbon Foot Print. The CFP of the Milwaukee Metropolitan Sewerage Districts is around 230,000 tons of Co2, which are rough 15,500 people. 2/3 of the CFP of the Capital works are coming from the pipes material. The Milwaukee regional studies showed a 7x decrease in the scale of the water quantity over ten years and provided extensive improvements for the regional utilities. Eco Trip a Television Series released in 2009 by the Sundance Channel hosted by David De Rothschild gives a fresh and exciting perspective on common commodities such as gold rings, t-shirts, Paper Napkins, Cell Phones, and Chocolate. Approaching the perspective from development, environmental impact, consumer understand and scientific relevance these 30 minute episodes will increase your understanding of common daily commodities. Bottled water for instance was recent episode which compared Bottled water to Tap water, the impact of bottled water on the environment. In the last year alone bottled water annual sales were consuming 30 million liters of water. Over the last decade, annual sales increased 177% that is roughly 9 billion gallons per year. What you don’t hear from bottled water companies is the difference in water quality and the life cycle of the product. 40% of all bottled water in the United States uses tap water to fill their products. Peter Gleick founder of Pacific Institute was interviewed and discussed that there is no difference in bottled water or tap water taste. Pay no attention to the advertisements on the label, the newspaper aids, and the billboards bottled water and tap water taste alike but are regulated differently. Tap water is more regularly regulated than most bottled water; 90% of US tap water meets EPA Standards for water quality.The Hetch Hetchy reservoir that provides 85% of San Francisco’s water falls under EPA regulation and is required to completed 487 water samples of the entire source monthly (only source sampling). Bottled water falls under FDA regulation and is required to be tested once a week. 8 out of 10 Bottles end up in Landfills or incinerated, 98 million bottles per day and 37 billion bottles per year. Not to mention that each of those bottles takes 500 years to decompose. Most water bottles are sold in polyethylene terephthalate (PET) bottles. According to the Pacific Institute, the US water bottle industry requires 17 million barrels of oil per year. Recycling one plastic bottle can save enough energy to power 60 watt light bulb for six hours. The energy cost associated with bottled water is even more interesting. The Beverage Marketing Corporation noted that the US bottling companies acquired 900,000 tons of PET Plastic last year alone (typically production is associated with natural gas and petroleum). Manufacturing/ production cost releases 2.5 million tons of Carbon Dioxide and requires 3 liters of water to produce on a liter of bottled water. The Plastic Manufacturing industry notes that it takes around 3.4 megajoules of energy to make a typical one liter bottle, cap, and packaging. One gallon of oil can generate 6,000 megajoules of energy. After manufacturing, packaging comes transportation and refrigeration. All energy used in the water bottle industry would consume around 50 billion barrels of oil per year, enough oil to run 3 million vehicles for a year. Bottled water is having a huge impact on the environment and ecosystems because it breaks down and contaminates natural environments. Birds (albatross) commonly mistakes plastic caps and wrappers as food and consumes the products and in turn the animal suffers a slow death. The Great Eastern Garbage Patch, is where ocean currents have redirected all of this waste into one area (twice the size of Texas) in the ocean. Oakland California introduced the Continuous Deflection Separator sewer system that is a catchment design system that uses natural water energy to remove solid waste from waste streams before they can reach the ocean or other bodies of water. Also, Gavin Newson began a campaign at San Francisco City Hall to stop purchasing Bottled Water, and now his campaign has affected 12,000 other city halls across the US. The financial cost of bottled water is 10,000 times more expensive than tap water; it is under-regulated, not properly labeled and is extremely harmful to the environment. The United States is the largest consumer of Bottled Water, in 2008 water bottles sales exceeded sales of all other beverages except carbonated soft drinks. The water bottle market is heard to stay, that being said we must require a labeling system to decipher the source and quality of the water so that you better understand what your purchasing. “One of the things that became immediately clear to me was that water is a truly unifying element. We all need it; we all want it and more than anything else in the world it is the one thing that connects us all,” said Irena Salina. Irena Salina director of Flow humanized international water politics by revealing the industry behind water, the discrepancies between public health and private interest unveil issues of scarcity, pollution/contamination, corporate profit and human suffering. Understanding different individual’s relationship with nature’s most critical resource, to encompass the global freshwater crisis. FLOW chronicles the stories of people fight for their right to water: following a community of concerned citizens in Michigan as they take on a corporate water-bottling plant; showing the massive protests of the Bolivian people against water privatization; and documenting simple technology implemented across India to cope with water shortages. You may think that China, Bolivia, India, and Lesotho are far away but the issues that each has mentioned hits close to home. The Case of Atrazine usage being banned in Switzerland and used in the United States so only a glimpse into indirect impacts on Freshwater. Atrazine has been proven to cause male frogs to become female ( sperm counts dwindle, and ovaries appear). “A person must consume 2.5 quarts of water per day from all sources (drinking, eating) to maintain health.” US EPA. “62,600 gallons of water are needed to produce one ton of steel.” US EPA. “The United States consumes water at twice the rate of other industrialized nations.” National Park Service. “75% of a living tree is water; 66% of human body is water; 75% of the human brain is water.” US EPA. “Americans flush 6.8 billion gallons of water down their toilets every day.” National Parks Service. “Alfalfa consumes almost 25% of California’s irrigation water, more water than any other crop in the state.” Natural Resource Defense Council. “The average 5-minute showers uses 15-25 gallons of water.” American Water Works Association. Preliminary estimates show that the total energy used to pump and treat water in California exceeds 15,00 GWH per year, or at least 6.5% of the total electricity used in the State per year.” California Department of Water Resources. “Leaks account for 12% of an average Californian’s daily water use.” The Pacific Institute. “Bottled water can cost 240-10,000 times more than tap water and may not be any more safe to drink. Around 25-35% of bottled water sold in the U.S. comes from a city or town’s tap water, sometimes further treated, sometimes note.” Natural Resources Defense Council. “Agriculture accounts for 87% of all the freshwater consumed each year in the U.S.” Livestock Production: Energy Inputs and the Environment, by David Pimentel. “When the well’s dry, we know the worth of water.”Benjamin Franklin.